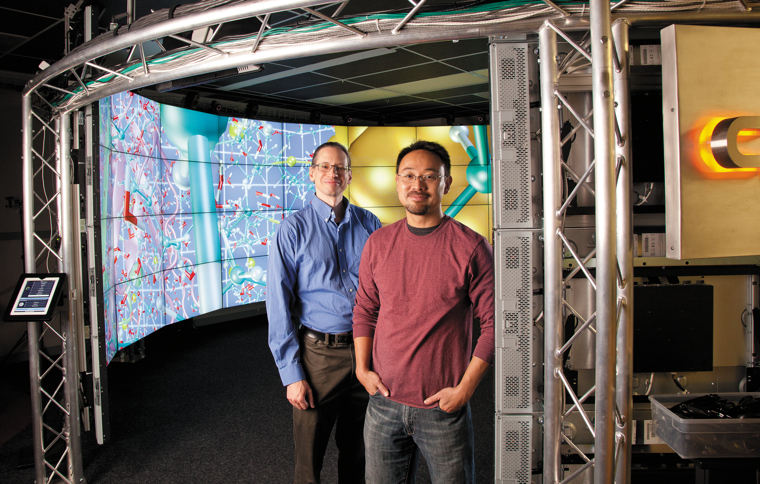 ANDY JOHNSON and JASON LEIGH stand inside the University of Illinois at Chicago’s CAVE2 environment, which includes custom monitors from Planar Systems that eliminate distortion in off-axis viewing. When UIC researchers couldn’t buy the 3D technology they needed, Planar Systems made it for them. According to the Electronic Visualization Laboratory at the University of Illinois at Chicago, which unveiled the first CAVE system at the ACM SIGGRAPH conference in 1992, CAVE is both a recursive acronym — cave automatic virtual environment — and a reference to Plato's The Republic, in which the Greek philosopher introduces the Allegory of the Cave to explore the ideas of perception, reality and illusion. In Plato's allegory, Socrates lays out a scenario in which prisoners, held in a cave since birth, can see only one wall, illuminated from behind them by fire. All they can see are shadows, which they perceive to be reality — real, but not real, like the virtual reality in EVL's CAVE — and now, CAVE2. There are Paleolithic and Mesolithic caves tucked away in many corners of the globe. There also are many CAVEs — cave automatic virtual environments — found in ­Austria, Japan and cities throughout the United States. But the very first — and trademarked — CAVE was built at the University of Illinois at Chicago and demonstrated in 1992. Today, UIC's Electronic Visualization Laboratory invites researchers, artists, students and other stakeholders to step into CAVE2 — a virtual reality environment unlike any other. "We've been finding ways to improve the technology since the first CAVE was built," says Jason Leigh, UIC professor of computer science and director of the EVL. "It's one of the things our lab is known for." The original CAVE was a four-sided (three walls and a floor) room that used projection technology to make visitors feel as though they had stepped into ­another world. Wearing 3D glasses and a location sensor that tracked their movements, researchers and students could interact with projected objects that appeared to float in front of them. Almost every other similar space in the world — whether called a CAVE or not — uses projectors to create such illusions. But projection has its limits, which the EVL began ­addressing more than a decade ago. "In the 1990s, the only technology available to us was projectors, and they had all these limitations," Leigh says. "They were dim, expensive, hard to calibrate, and the color was frequently off. But we understood early on that things like CAVEs and tiled display walls were the new lenses through which scientists were going to look at their data. If they were going to spend millions of dollars on ­instruments for generating or collecting all their data, it made sense to us that they'd want something that gives them the best look at their data. Why look at it with a poor display?" In 2002, EVL began prototyping tiled, flat-panel LCD screen walls. Early LCD screens were expensive and surrounded by thick frames, or bezels. When arranged together to make up a bigger screen, unsightly gaps created distortions in the picture. They also did not project in stereoscopic 3D. But the researchers at EVL believed — correctly — that display manufacturers would address such limitations over time, making LCDs well suited to CAVE designs. Launched in October 2012, CAVE2 is a circular room — 24 feet in diameter, roughly 7 feet high — comprising 18 columns of four 46-inch LCD screens. CAVE2 was built in the same space as UIC's original CAVE, but the new incarnation offers much more room to move around. "The quality of the graphics is so much better," says Andy Johnson, UIC associate professor of computer science and a collaborator on CAVE2, who says that he was drawn to the EVL years ago by the original CAVE design. "The contrast is better, the color is better, the number of pixels is incredible. Moving around the space feels more natural. It's a much better collaborative experience than it was before." CAVE2 flat-panel LCD screens include micropolarizers, which, when viewed through stereoscopic glasses, ­create a 3D effect — or the illusion of depth — like that found in movie theaters showing 3D feature films. The challenge with such technology is that it's best viewed straight-on. But in CAVE2, an immersive environment with displays that span from the floor almost to the ­ceiling, straight-on viewing isn't always possible. "One of the issues you run into with micropolarization is a problem with vertical off-axis viewing," Leigh says. In other words, when a user looks up or down at the display, the image appears distorted. "You get ghosting when you're not aligned with the micropolarizers. So we asked Planar if it was possible to shift the micropolarizers to accommodate off-axis viewing for LCD panels at the extreme top and bottom of the CAVE2." Custom micropolarizers were configured for CAVE2 by the manufacturer, Planar Systems, and EVL provided funding for the research. At first, there was some concern that the necessary adjustments would hinder the displays' brightness. But in the end, Planar succeeded in customizing panels for the CAVE2's top and bottom rows, in just the way EVL researchers had envisioned them. The modifications were made using Planar's Clarity Matrix line of passive stereo displays, which form the middle rows of CAVE2. "We evaluated the panels, tested them in various configurations, and we were confident enough that we could pull the trigger and go for the full system," Leigh says. The EVL team had to hustle to meet the deadlines for opening CAVE2. Five students spent the summer of 2012 building the system, but the displays needed to be delivered quickly. "CDW•G was instrumental in making the CAVE2 possible because they could work directly with Planar to fulfill our order," Leigh says. "CDW•G is a preferred vendor of the university, which made it possible for us to get the exact products we needed from the vendor we had a trusted relationship with. If we hadn't gone through CDW•G, we still wouldn't have a CAVE2 today." In the new CAVE2 system, applications, data and graphics are processed in a server cluster located 10 feet from the CAVE itself. The cluster includes 36 servers — one per two screens — powered by 2.9 gigahertz, 16-core Intel Xeon processors and NVIDIA GeForce GTX 680 graphics cards. The current cluster provides more than 4,000 times the processing power of the original CAVE's MIPS-based system. It also boasts 9,000 times the memory and 22,500 times the original CAVE's storage space. The system's 100-­gigabit-per-second network connection is a huge upgrade over its predecessor's 10-­megabit-per-second network. When will we have glasses-free 3D? Read more here. The Planar Clarity Matrix displays are unique in that their components that process images and give off heat also sit in the equipment room with the servers, making them easier to service as well as keeping the CAVE2 room comfortable without additional cooling. The rack-mounted Planar electronics drive the displays and communicate with the screens over standard Ethernet cabling. Above the CAVE2 is a circular array of Vicon ­infrared cameras, which detect location sensors on 3D glasses to calculate the wall imagery so that the perspective changes as the viewer moves his or her head. "We can give someone the perfect first-person view of a virtual world," Leigh says. "It makes objects appear to float, so you can look around and under them." In the original CAVE, the location sensor was tethered to the system for motion tracking. The new wireless ­design offers users freedom to move about the space. "One of my students is looking at models of the brain and analyzing blood flow with a member of the bio­engineering department," says Johnson. "The brain is very 3D, so they're taking MRI scans to model where veins and arteries are. Then they're using simulation software to figure out how all the smaller veins and ­arteries fill up the space, and to simulate blood clots and strokes and figure out how blood reroutes itself." The EVL has ported other programs and data to CAVE2, including a simulation of a high-speed rail project ­being done at UIC in collaboration with researchers in ­Urbana, Ill., to analyze stress and strain data, as well as a fly-through of Mars used at Chicago's Adler ­Planetarium. David Hofman, professor of physics at UIC and the acting head of the Physics Department, says CAVE2's ­visualization capabilities make it a natural tool for ­research. Now his department is working to integrate CAVE2 with the curriculum. "I've been blown away by its capabilities," Hofman says. "We have a very popular introductory astronomy course, and a big part of modern astronomy is visualization. We see these beautiful pictures from NASA and the Hubble Telescope. Now being able to see them dynamically and move around them is an incredible experience. We're really at the cusp of being able to use this technology in physics education."